Corporate in-house/ onsite workshops are available for groups of 6+. Build a Team approach and Align the Output and Quality of projects. Can't make it to the training? By the end of the day you will be building a Robust Project Plan from Scratch! Excellent! From someone who had no knowledge it is now a tool I understand and can use. I can now guide my team members to use the MS Project correctly. The instruction was clear and informative. The subject matter was precise and on the spot, without all the information we didn't need. I will now be able to program my specific roles/tasks and adopt the program to my job. For complex projects which require more detail and accuracy, eg. Construction Programs, Shutdowns or Contract schedules, we provide a recommended outline and structure to detail your program. Complex calendars for Rosters, FIFO Night Shifts, Shutdowns, 24hrs. Combine Your Entire Knowledge Across Multiple Projects. We incorporate your entire knowledge of building project plans and insert multiple projects into one Master Project. Analyse and Manage Multiple Projects across your organisation, create a combined resource pool and review your total projects requirements or whole of business requirement. This course provided time saving tips. It helped me develop navigational skills and ability to effectively use as a live project tracking document. Additionally it increased my ability to populate infomation and will certainly save me time during the projects I manage. Can't make it to the classroom? Watch a 90 second sample from a Current Training video! 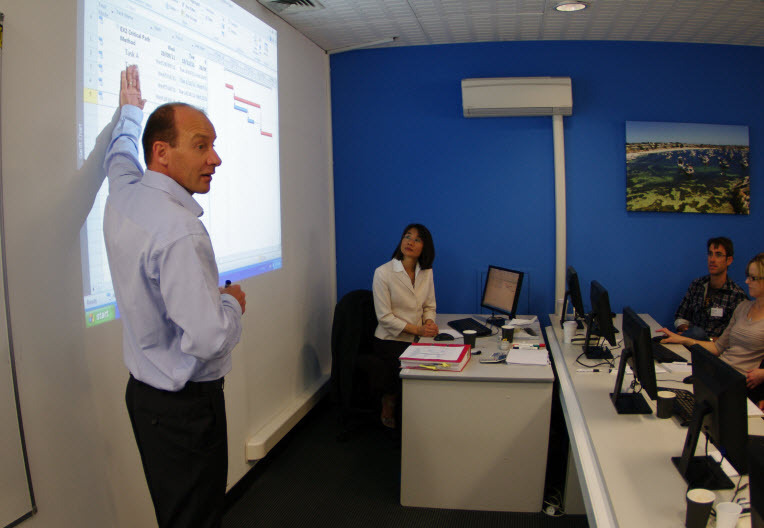 What Sets Our Microsoft Project Training Apart? "It's more than software training. It's Microsoft Project as a Tool for Real Life Projects"